November 30-December 1 | Leaving 5 pm; Returning 5 pm. Women of New Life and their friends are invited to this overnight retreat at LOMC in Oregon, IL. 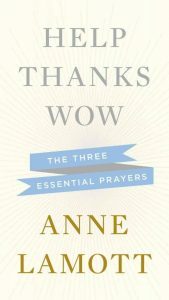 Pastor Rakel will be leading this and using the book “Help Thanks Wow” by Anne Lamott as a basis for our conversations together. It is these three prayers – asking for assistance, appreciating the good we witness and feeling awe at the world – that get us through the day and show us the way forward. Cost is $100 which includes meals, lodging and the book. We will be carpooling from New Life that Friday at 5:00 pm. Register below and payment can be made on our website.